Volunteers hard at work. Photo by John Schroder. It was a cold, cloudy and breezy morning when we met around 10.30am beneath the A38, Bristol Road South fly-over, opposite the Rubery Cutting. We were met by Steve Hinton (Senior Ranger, Lickey Hills Country Park). After a few words on health and safety, hard hats and high visibility vests were handed out before Steve told us about the work to be carried out. The Rubery Cutting (also known as Leach Green Quarry) is situated on the corner of Bristol Road South (the A38) and Leach Green Lane, Rubery, Birmingham. Declared a Local Nature Reserve (LNR) in 1991, it was for many years used as an educational site for first year geology undergraduates. However, in recent years it has become somewhat neglected, overgrown and used for dumping rubbish. 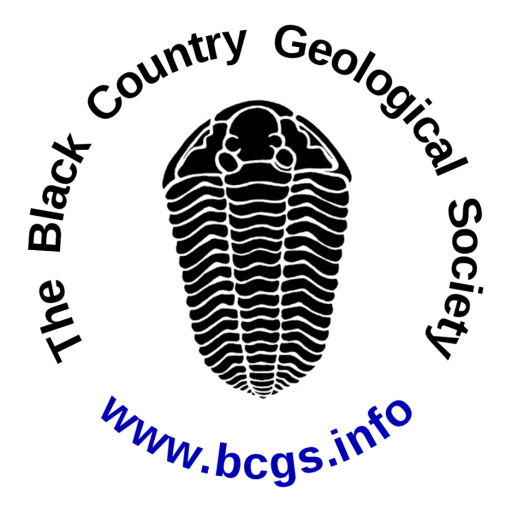 The Birmingham & Black Country Nature Improvement Area (B&BC NIA) have begun supporting work to enhance the educational value of the site as one of Birmingham’s most important geological exposures. They are a partnership of 50 organisations that have come together to deliver significant improvements to the natural environment of Birmingham and the Black Country. A lead partner in the B&BC NIA is the Birmingham & Black Country Wildlife Trust. In 2006 the site was established as representing a unique aid for the interpretation and understanding of early Silurian palaeontology and associated palaeo-environments. The site’s exposures comprise Silurian Rubery Sandstone (from the Upper Llandovery) unconformably overlying Lickey Quartzite. Previously thought to be of Cambrian age, the Lickey Quartzite has now been re-classified as Lower Ordovician. The Rubery Sandstone is also supposed to be very fossiliferous, however none were encountered during our visit. Some of the more heavy duty clearance work, involving the removal of trees, treating stumps with herbicide and scrub removal from the access path had already been undertaken. 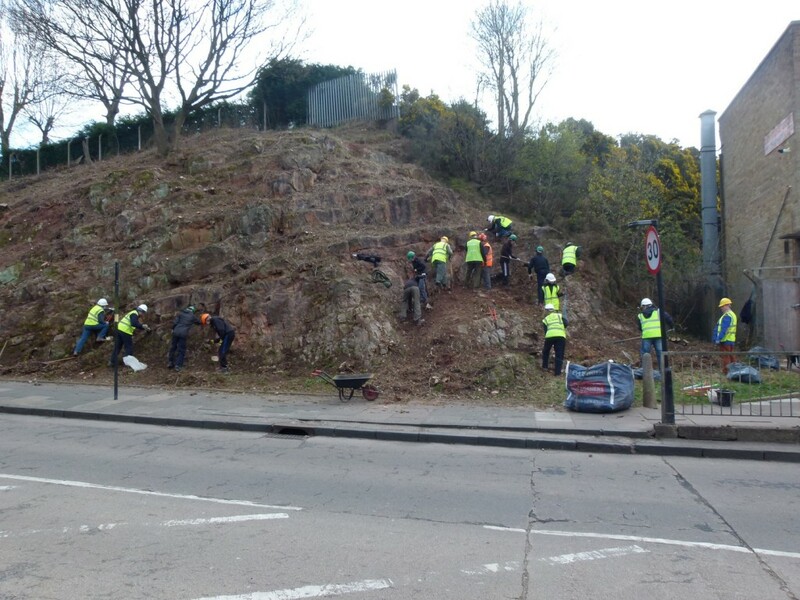 Joining volunteers from the Lickey Hills Geo-Champions group, BGCS members assisted in clearing rubbish, scrub and soil from selected rock faces. 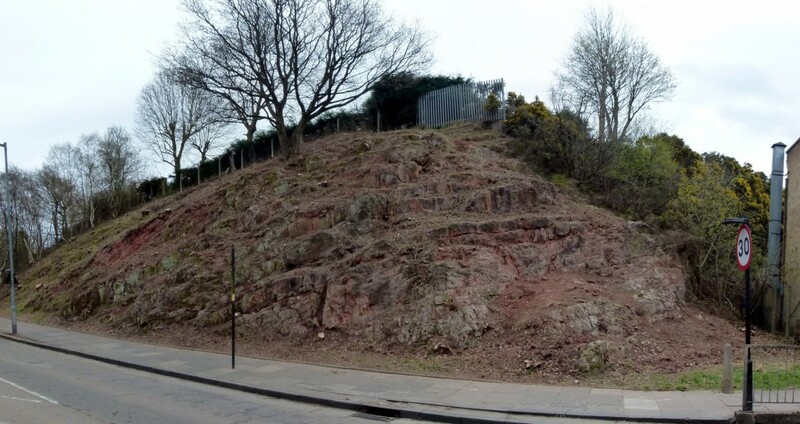 Going forward, the plan is for both groups to work with the Birmingham City Council Ranger Service to undertake ongoing maintenance, to ensure that the exposures remain visible and free of vegetation. Rubery Cutting at the end of the day. Photo by John Schroder.